We’d love your help. Let us know what’s wrong with this preview of Notes from My Captivity by Kathy Parks. So when Adrienne is offered the chance to write an article that will get her into her dream school and debunk her foolish stepfather's belief that a legendary family of hermits is living in the Siberian Adrienne Cahill cares about three things: getting into a great college; becoming a revered journalist like her idol, Sydney Declay; and making her late father proud of her. To ask other readers questions about Notes from My Captivity, please sign up. Lola early teen maybe through young adult? It's mixed feelings time, y'all! Some parts of this book were kind of awesome. I mean, Siberia? Sign me up! I love survival stories in general, and in that respect this book delivered for sure. But then some things really threw me off, too. So let's discuss them all, shall we? Adrienne really grows a lot during the book. She starts off kind of bratty, honestly. And I get that she was still grieving the loss of her father (and I assume she always will, I don't think people "get over" such things) but that really didn't mean that she needed to be awful to her stepfather, who was kind of risking a lot to take her on this trip. Alas, she learns quite a bit about herself on this journey, and I really loved watching her development. The survival part of the journey was awesome. Especially when the group her father worked with was in the mix, as they made me chuckle a lot. But even when there were moments of humor, it was clear that the terrain and climate were no joking matter. And frankly, I'm a sucker for a survival journey, so that worked. It definitely had intense moments, and I wasn't always sure if or how things would work out. It was good that the story definitely did not feel safe, and that the stakes seemed very high at every turn. Made for a very readable experience, as I was eager to know what was going to happen next. Plus, the intensity definitely made for some solid feels. There was a bit of magical realism in the book that didn't really attract me. I think it kind of made the story seem... a little "much"? Like if you're already in Siberia being captured by a family you thought was fake, maybe that is enough outlandish stuff for one book? 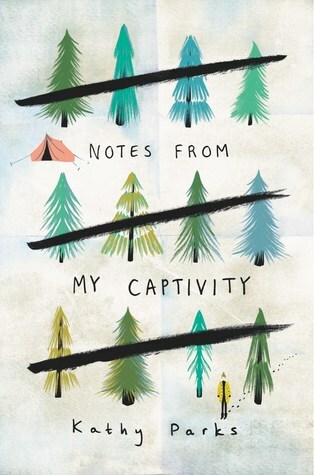 Notes from My Captivity is a standalone Young Adult novel. The book is divided into three parts. The narrator is Adrienne (1st person POV). The story starts in Colorado. Adrienne is planning to go to the Siberian wilderness with her step-father Dan. Adrienne is 17 years old and wants to be a reporter. Dan has been studying a family (the Osinovs) who supposedly live in Siberia. But most people do not believe that they exist. Adrienne has been allowed to tag along on the adventure. I found the beginning of this book to be very intriguing. The idea of Adrienne and her step-dad going to remote Siberia seemed fascinating. And would they come across this crazy family? I've never read a book about a trip to Siberia. So I found this premise to be unique and very different. However, at the end of Part One something happens that I wasn't really expecting. It really changed the dynamics of the story a lot. It made the story much darker than I was expecting. And I didn't love that part of the book. Something happened that was just too much for me. In Part Two the book takes a completely different direction, which I at first did not love. But it actually ended up growing on me. This story was not really what I was expecting. Also, the author included some magical realism in the story. I can't decide if I liked this part of the story. There was one aspect of it with the little girl that I loved. But another part just seemed too out there for me. Overall, this book definitely had some enjoyable elements. I especially enjoyed everything to do with Siberia and Adrienne documenting what she saw and did. This was a surprisingly good book! I was actually really excited to read this because of the interesting premise until I saw a bunch of bad and not-so-great reviews from gr friends :( but I’m glad that I did read it. This book was absolutely fantastic. It was such a confusing yet beautiful story that reminded me a tiny bit of Stolen by Lucy Christopher and you all know how much I love that book! I can admit thought, this book is very flawed but yet it's so incredibly good. Adrienne thought this would be a summer to remember. She planned on writing THE article, which would be her ticket to college, but when their trip takes a tragic turn, Adrienne just hopes to get out alive. • Pro: It was amazing to see the changes Adrienne experienced during this story. I really liked the way Park slowly peeled back her layers to let us actually see what was at the root of Adrienne's pain. I also thought she was quite funny, and her commentary during the first part of the book was Adrienne thought this would be a summer to remember. She planned on writing THE article, which would be her ticket to college, but when their trip takes a tragic turn, Adrienne just hopes to get out alive. • Pro: It was amazing to see the changes Adrienne experienced during this story. I really liked the way Park slowly peeled back her layers to let us actually see what was at the root of Adrienne's pain. I also thought she was quite funny, and her commentary during the first part of the book was pretty hilarious. • Pro: After many years, Adrienne was still grieving her father's death. Her pain was heartbreaking, and I cheered as she made progress working through her grief. • Pro: Faith was a big theme in this book. Faith in a higher power, faith in your family, faith in a legendary family, faith in yourself. It pops up over and over again in this story, and Parks approached it in a very thoughtful way. • Pro: The Siberian setting was pretty much new for me, and Parks did a great job exposing us to both the beauty and the dangers of the land, as well as the challenges faced by those living there. • Pro: There were tears! There were several moments in the book, which just hit me in the feels. The fact that I shed tears for these characters means I formed an attachment to them. • Pro: The bond Adrienne formed with the Osinov's was really special. She worked hard to earn their trust and affection, but by the end, there was not doubt that the love was reciprocated. • Pro: I wasn't expecting it, but I pleasantly surprised by the magical elements Parks incorporated in this story. They were used wisely and added a little mystery to this tale. • Pro: There were some really heart-pumping moments in the story, and I really felt the urgency to survive during these scenes. • Pro: What an unexpected, but beautiful ending. This book presented itself as one thing, but it was really about so much more, and the conclusion left me in a happy place. Overall: An inventive and intriguing exploration of grief, faith, family, forgiveness, and love. These creatures exist. William knows this but a stupid journalist is trying to disprove him and she is doig a good job. So what else was he to do but go into the forest and find these creatures once ans for all. His step daughter Adrienne is coming with, it will be a trip of a lifetime but only if she survives. They found these monster these monsters killed her step father and his crew. These monsters are keeping her alive for now but then what? However, my immense dislikes outweigh my slight likes on this one. What is it about? A girl determined to write an article exposing her step-father's theory of a long lost family of Siberia to be myth, heads out with her step-father and his team to locate evidence of the Osinov family. Many twists unfold after people start dying soon into their trek. What did I love? I love the idea of a hidden family in the wilderness of Siberia. I loved the magical realism element that the family offers as well. I like the theme of communication and language throughout. Also - plenty of plot twists that will keep you guessing! What I didn't love: I didn't really enjoy the MC in this one - she seemed unreliable and sometimes just mean. I think there were also too many themes/plot lines competing in this novel and distracted from the story itself. The writing itself was a little awkward at times and a little repetitive. A powerful story of hope, love, survival, forgiveness and the force of nature. Adrienne is seventeen aspiring to be a journalist. Her stepfather is obsessed with the Osinovs, a family in Siberia that he believes survives in the wilderness away from the modern world. Although everyone including Adrienne herself dismiss his views as fiction, her step father decides to embark on an expedition to once and for all prove his theories. Once on the trail to Siberia, Adrienne embarks on an adventure that A powerful story of hope, love, survival, forgiveness and the force of nature. Adrienne is seventeen aspiring to be a journalist. Her stepfather is obsessed with the Osinovs, a family in Siberia that he believes survives in the wilderness away from the modern world. Although everyone including Adrienne herself dismiss his views as fiction, her step father decides to embark on an expedition to once and for all prove his theories. Once on the trail to Siberia, Adrienne embarks on an adventure that forces her to acknowledge that the truth is indeed stranger than fiction in some cases. Adrienne wants to be a reporter, and she thinks the best way to secure her entry into the college of her dreams is to pursue the story that's haunted her stepfather: that of the Osinov family, who left their home in Moscow and moved to a remote area of Siberia. Her stepfather believes they exist, and he's written fervently about it. Adrienne is skeptical -- in part because one of her favorite reporters penned a scathing takedown of her stepdad's work. She is convinced that, on this trip, she'll Adrienne wants to be a reporter, and she thinks the best way to secure her entry into the college of her dreams is to pursue the story that's haunted her stepfather: that of the Osinov family, who left their home in Moscow and moved to a remote area of Siberia. Her stepfather believes they exist, and he's written fervently about it. Adrienne is skeptical -- in part because one of her favorite reporters penned a scathing takedown of her stepdad's work. She is convinced that, on this trip, she'll settle the score and earn her entry into Emory. When Adrienne, her stepfather, and their Russian pals along for the trip arrive in Moscow, all seems fine. But it's when they begin making their trek into Siberia that things go south. And fast. Before long, the only person left alive is Adrienne. That's when she meets the Ostinovs and learns how to survive with a broken arm and super broken Russian. How can she connect with them? Why are they out there? Why did they leave? And why did they choose to help keep her alive? This is a book about grief, loss, and family. It's also about forgiveness and magical thinking. Adrienne lost her father tragically in a drunk driving accident, and that pulls through the story in really organic and honest ways. She struggles to believe her stepfather and love him the way he loves her because her grief is still there. Because leaning into that would mean leaning away from what was taken from her. In Siberia, Adrienne develops a plan to get out: she'll make the oldest son in the family fall in love with her. It's manipulative, but it's also kind of effective. But when she learns why it is the family has gone off grid and developed this life outside the mainstream world, Adrienne is forced to confront not only what her goals are -- that of escape and that of writing this article all together -- but she's forced to confront grief head on and do so in a way that absolutely will transform this entire experience for her. This book isn't entirely contemporary. It's got a bit of magic in it, likely best described as fabulism. It's engaging and powerful, and moreover, it's really funny. Adrienne has great comic timing, and her ability to read people easily induces laughter. More, as Adrienne removes some of the walls she has around her, she's able to better understand why people live as they do....and what that does or doesn't mean for her or society as a whole. Great setting, great characters, and a memorable voice make for a unique story. I devoured it. I've not read Parks before but now I want to go revisit her other YA titles. Adrienne is going on a trip with her stepfather Dan to Siberia. That’s where the Osinovs, a family of urban legend, is believed to be. Dan believes it wholeheartedly, Adrienne is a sceptic. They set off with their guides through the wilderness of Siberia. The plot is spoiled in the synopsis, they are real instead of urban legend. This book is split into parts, and each part feels different. The first is an adventure story, the second is survival horror, the third is magical realism. It was a lit Adrienne is going on a trip with her stepfather Dan to Siberia. That’s where the Osinovs, a family of urban legend, is believed to be. Dan believes it wholeheartedly, Adrienne is a sceptic. They set off with their guides through the wilderness of Siberia. The plot is spoiled in the synopsis, they are real instead of urban legend. This book is split into parts, and each part feels different. The first is an adventure story, the second is survival horror, the third is magical realism. It was a little much. There were some things that happened that I would rather have not, but it did move the story along. The romance could have been dropped and it would have been fine. It didn’t add much to the plot. This was a really interesting and different book. Considering I've read 2 survival stories in a row, I'm gonna compare them. This one was definitely lighter (even though there were lots of tragedies and deaths), the atmosphere was still a bit less depressing than in I Am Still Alive. I especially liked the whole "surviving in Siberia" part. It was fascinating. The first part of the book is slightly boring because they are just preparing for the trip and going to the airport and stuff, but the mo This was a really interesting and different book. Considering I've read 2 survival stories in a row, I'm gonna compare them. This one was definitely lighter (even though there were lots of tragedies and deaths), the atmosphere was still a bit less depressing than in I Am Still Alive. I especially liked the whole "surviving in Siberia" part. It was fascinating. The first part of the book is slightly boring because they are just preparing for the trip and going to the airport and stuff, but the moment they reach their destination, the book takes a different turn. The MC stops being annoying (she kept being whiny about her stepdad) and things start to get fun. Not what I was expecting but I quite liked it. Some mystery, drama, survival, love and a bit of magic, all in one book. The only thing I really didn't like was the main character in the beginning, but later on she grew up quite a lot (still made mistakes and acted stupid sometimes but who doesn't?). I kind of was hoping for a different ending but I think the one that we got fits the story quite well. Hands down one of the best books I've read in 2018! I loved Adrienne's character; her inner dialogue was so downright funny and snarky that at times I would laugh out loud. It really reminded me of myself. The mystery behind the Osinov family kept me on the edge of my seat, but I also fell for this family and was really upset to see how things ended. Overall, this was a story about strength and forgiveness, and also a look into the things we take for granted in life. Highly recommended! I loved this so much more than I thought I would! It's truly a wild ride... You start out thinking it is one kind of story and then it takes two different sharp turns. In the end, I loved the experience and was very moved. I was quite impressed by this book. Captivated my heart and mind from start to finish. Absolutely recommend. I enjoyed this book a bit, and while the first 60% is a solid 3 stars, the last 40% really picked up and made me bump it up to 4 stars. My biggest gripe with this book is the constant references to instagram and tumblr. I understand that the main character is a 17 year old girl, but it really dates the book, and makes me cringe. I can't remember the exact line and don't have the book in front of me anymore but at one point Adrienne makes a statement that one of the guys would be instagram worthy I enjoyed this book a bit, and while the first 60% is a solid 3 stars, the last 40% really picked up and made me bump it up to 4 stars. My biggest gripe with this book is the constant references to instagram and tumblr. I understand that the main character is a 17 year old girl, but it really dates the book, and makes me cringe. I can't remember the exact line and don't have the book in front of me anymore but at one point Adrienne makes a statement that one of the guys would be instagram worthy with a shave. Just... ??? There is literally zero reason to mention instagram. Mentally she brings up "dating guides and advice" she's seen on Tumblr as well. Again, zero point to all this other than to try and add more appeal and relatability (shh its a word even though spell check is telling me it isnt) to younger audiences. Another gripe... all those Taylor Swift references. Cheesus Christ. Other than that I expected your typical kidnapping story, but got something else entirely, and I rather quite liked it. The ending almost made me cry. What a fascinating, heart-rending, human condition story. It isn't a close-and-forget book (although those can be delicious, yes! ); rather, it's a can't-stop-thinking-about book. I have such compassion for the YA lead. Her voice is honest, and there's an enormous, moving maturation of her character. All the secondaries are strong, no matter how small their part. I'm not satisfied with the ending--it's acceptable, believable, but I want more. This book was so awesome! I loved reading about this aspiring journalist and being held captive by a family she didn't think was hiding out in the wilderness! Such a great book! A fantastic read that I was not expecting. I loved it. This book got off to a shaky start. I couldn't get used to Adrienne's voice, and the overdone snark didn't help. Even the premise seemed as though it might fall apart at the slightest pressure, and I was seriously considering abandoning the book very early on--something I rarely do. I'm happy to say that the story gained momentum as it went on. The characters felt more credible, and the harsh landscape provided an excellent backdrop to a plot that got very dark, very quickly. As the material got This book got off to a shaky start. I couldn't get used to Adrienne's voice, and the overdone snark didn't help. Even the premise seemed as though it might fall apart at the slightest pressure, and I was seriously considering abandoning the book very early on--something I rarely do. I'm happy to say that the story gained momentum as it went on. The characters felt more credible, and the harsh landscape provided an excellent backdrop to a plot that got very dark, very quickly. As the material got more intense, the humour and emotional depth increased in equal measure, and by the end of the book I had tears in my eyes and was sad to say good-bye to characters I had swiftly come to love. I have some conflicting feelings about Notes from My Captivity. On one hand it was an immersive read that made me care but on the other I felt like the story didn't give me much. It's a rather unconventional tale of facing some hard truths in life. Notes from My Captivity was something different. There's a nice slow build up into the main storyline and once we really got into the meat of the story I was taken in. I wanted to know. Alongside the main character(s) I needed to debunk the myth. I did I have some conflicting feelings about Notes from My Captivity. On one hand it was an immersive read that made me care but on the other I felt like the story didn't give me much. It's a rather unconventional tale of facing some hard truths in life. Notes from My Captivity was something different. There's a nice slow build up into the main storyline and once we really got into the meat of the story I was taken in. I wanted to know. Alongside the main character(s) I needed to debunk the myth. I didn't expect the sad undertone to the story but it was one that proved vital to how the story developed and took on meaning. The short articles sprinkled throughout the book helped provide context and in the end closure. Sometimes we find clarity in the most unimaginable situations. It's when you're all alone (and fighting to survive) that you get a chance to reflect and see the little truths in life. "...Being a skeptic is easy. It's belief that's hard..." (ARC, p. 20). This statement is so simple you don't even think about it but it resonated with me when I read it. Sometimes the smallest thing can have a big impact. Adrienne is a bright, resourceful girl whose father's death left her hollow. Given the way he was taken I don't blame her resentment. She hid the negativity inside her well. It took some serious happenings for her to realize what she needed to do to let go and move on but I completely respect her desire to do right by the people she loves/comes to care for. Her self-deprecating inner thoughts were funny to read- not the right time to be snarky or swooning but she's young. Adrienne's trip into the Siberia woods changed her for the better. I was really enjoying this book when it was a rugged, outdoor adventure book that featured a kidnapping mysterious family. And then it got weird and a magical element was added in that I just wasn't personally wanting in this story. It was overall a really enjoyable read and definitely something different from a lot of YA that is currently releasing so I would still definitely recommend checking this one out.